Please note: Bring your own drinking water as potable water is not available in the park. Ksgaxl/Stephens Islands Conservancy is on the northwest coast of British Columbia, approximately 30 kilometres west of Prince Rupert, and is within the Traditional Territory of the Coast Tsimshian. The conservancy contains Stephens Island and other adjacent islands including Prescott Island, Philip Island, Arthur Island, Skiakl Island, the Archibald Islands and the Tree Nob Group. 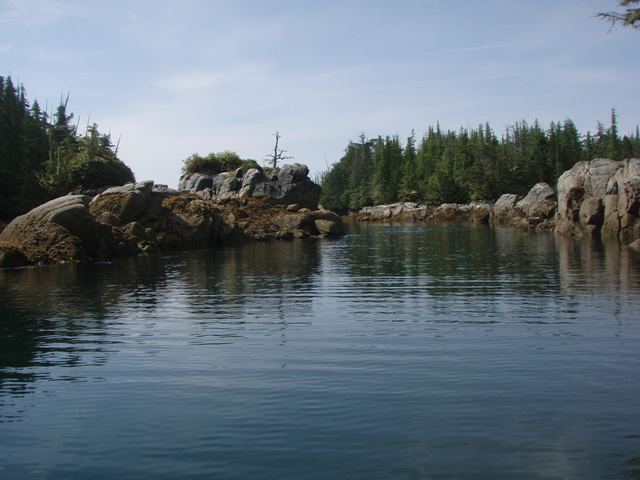 Ksgaxl/Stephens Islands Conservancy was identified for conservancy status during negotiations between the provincial government and First Nations governments following the North Coast Land and Resource Management Plan (LRMP). Ksgaxl/Stephens Islands Conservancy protects an entire island group that has high marine and terrestrial values including habitat for numerous bird, marine mammal and marine invertebrate species. Ksgaxl is part of a world-class system of wilderness-oriented protected areas along the north and central coast of British Columbia. The terrestrial and marine ecosystems are healthy and productive. The Ksgaxl/Stephens Islands area has a long history of use by First Nations. The conservancy is associated with Lax Kw’alaams and Metlakatla First Nations (collectively Coast Tsimshian). Wilderness-based recreation opportunities in Ksgaxl include camping, kayaking, fishing, scuba diving and wildlife viewing. Recreational features include marine mammal viewing, small beaches, and many small island groups such as the Archibald Islands. The conservancy is collaboratively managed by the Coast Tsimshian and BC Parks. Cultural Heritage: Ksgaxl means “Place of Shrub” in the Coast Tsimshian language Sm’algyax. Nine recognized archaeological sites and at least seven named First Nation village sites are within the conservancy. The area has long been used by First Nations for food and ceremonial purposes. Ksgaxl and adjacent areas are still used for harvesting of marine species such as salmon, rockfish, halibut and red sea urchins, and other resources. Coast Tsimshian rights to Ksgaxl stem from a history of wars between the Tlingit and Haida going back thousands of years. Ancestors of present-day Coast Tsimshian shed blood to ensure their people could use the area for food gathering. Ksgaxl falls within the traditional territory of the Gitwilgyoots, the tribal stewards of the area. In appreciation of the tribes having stood beside them to protect the area, the Gitwilgyoots allocated portions of the islands to other tribes and house groups, such as the Coast Tsimshian, for activities such as harvesting of sea resources, hunting, trapping and camping. The islands are important intertidal harvesting area for sam’ k (clams), gaboox (cockles), galmoos and (crabs), hadani (black cod/sablefish), as well as t’ibiin (sealion) and uula (seal) and bilhaa (abalone). Kibaau (seaweed) is particularly important to those who currently camp on the islands. Many plants are harvested for medicinal and material purposes. Examples of plants used traditionally include: salmon berries, blueberries, huckleberries, hemlock cambium (inner bark), ha’tal (red cedar bark), wal (yellow cedar), luwi (alder tree), sahakwdak (yew), and wooms (devil’s club). Conservation: Ksgaxl protects a biologically diverse mix of marine and terrestrial ecosystems including numerous small islands and two moderate size islands, Stephens and Prescott. The terrestrial portions of these islands are important for marine mammal and bird nesting habitat, while the shallow waters around them support diverse marine plants and animals. Wildlife: Terrestrial mammals in the conservancy include wolves, black-tailed deer, and a number of small fur-bearing animals. Marine mammals that use the area include killer whales (red-listed), humpback whales (blue-listed), Stellar sea lions (blue-listed), Pacific white-sided dolphins, harbour seals, and porpoises. Sea otters (blue-listed) have recently been reported from the Triple Island in the northern part of the conservancy and nearby Rachael Island, though it is unknown whether they are breeding in the area. There is an active management planning project underway for this conservancy. Visit the Ksgaxl/Stephens Islands Conservancy management planning page for more information on the management plan for this conservancy. Salmon migration routes surround Stephens Island, but are mostly concentrated to the north of Stephens Island. Scuba diving at the Tree Nob Group is excellent due to the high marine species diversity and large underwater reefs with marine plants including eelgrass up to two metres long. Waterfowl, eagles, spawning salmon and the occasional deer can be seen in the conservancy. Humpback whales, killer whales, Dall’s porpoises, Pacific white-sided dolphins, sea lions and harbour seals can also be seen in the adjacent marine waters.